The FS-78 is a flourite doublet APO refractor. This scope produces wonderful images with great contrast. When the FS-78 scope is used alone, it can be carried on a Takahashi EM-10 or EM-11 mount. The FS-78 provides great views, and performs surprisingly well for visual observations. The FS-78 is a good travel scope and can easily be carried on an airplane. I took the FS-78 to Mauritius Island and imaged the transit of Venus with it. I used the FS-78 to take photos during a solar eclipse in Curacao. This telescope traveled to Lake Titicaca, Bolivia with me and was used to image the Tarantula Nebula. I used it for CCD imaging during a vacation in Hawaii, and occasionally use it from the backyard. I also have an image of the Orion Nebula taken with the FS-78 scope from my backyard in Scottsdale, Arizona. The FS-78 has a focal length of 630 mm. The refractor can be used for prime focus imaging at f8. This photo shows the FS-78 on an EM-10 mount that was converted to a Temma Jr. GOTO mount. 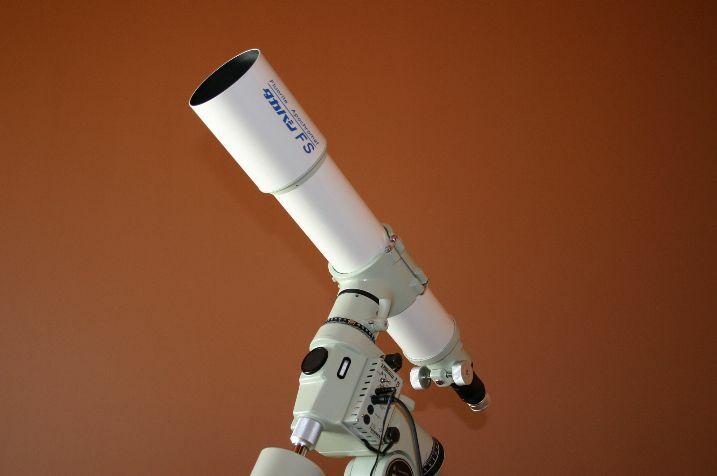 The FS-78 is sometimes used as a guidescope for astrophotography with a larger telescope. List of images taken with the FS-78. Back to the description of Sid's equipment.